Sometimes filling a fountain pen is overkill for the project at hand. 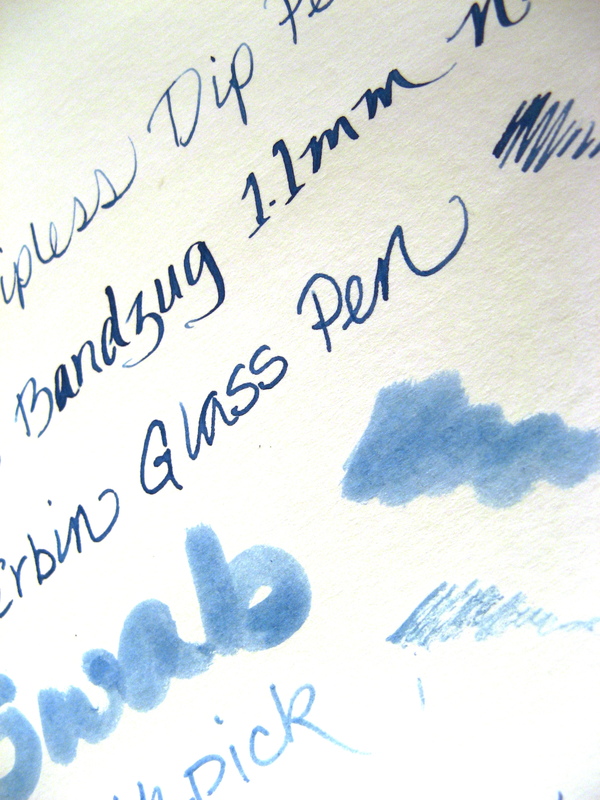 On such occasions, even a partial fill would be excessive and then there is the chore of cleaning a fountain pen. This is the time to break out a dip pen. Ebonite Dipless Dip Pen, Brause Bandzug 1.1mm nib, J. Herbin Glass Pen, cotton swab, and toothpick with Rohrer & Klingner Blau Permanent on Clairefontaine GraF it 90g paper. My favorite dip pen is an ebonite model with a feed. It came with a fine nib that requires only one dip to produce up to a full page of writing. 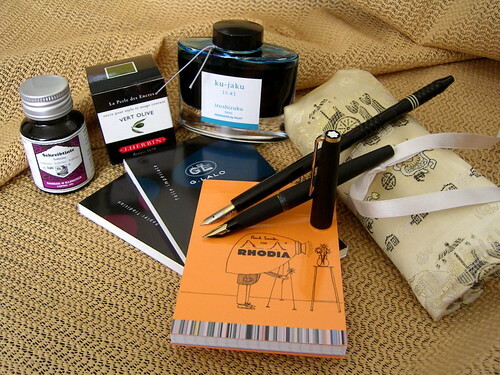 For an inkophile, it’s a great tool to satisfy a fickle nature. When only a few words or a swash of color is needed, there are kits from Brause and other companies that offer some amazing nibs. A simple plastic or wooden holder will do for such limited use. The J. Herbin glass pen is my choice for testing a tiny amount of ink though I’ve never gotten the hang of it for writing more than a few words. Glass is so easy to clean that I find myself using it despite any drawbacks. If a small dab will reveal the color’s character, a cotton swab dipped in ink will do the trick. Even a toothpick can put down a valuable squiggle. So don’t fill it. Dip it when a small amount of ink will do the job. More at The Times of India, Andy’s Varuna Dip Pens, and Ranga Ebonite Dip Pens. Pictured are bottles of Rohrer & Klingner Solferino, J. Herbin Vert Olive, and Iroshizuku Ku-Jaku, pads of G. Lalo (samples from PenandCo.) 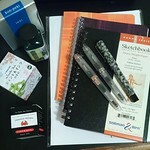 and Rhodia paper, a 1970′s Montblanc 220 fountain pen with an OB nib, an Ebonite Dipless Dip Pen, and a pen wrap from HisNibs.com. I’m still getting the hang of dip nibs, but I have to agree with Woosang, they’re so much cheaper and they’re (relatively) easy! And so easy to clean up and store.